Work Orders, employee records, customer records, customer contacts, assets, and proposals can be created using this shortcut. Clicking the New button creates a new entity depending on which window or grid is open and active. New – Creates a new entity in the active (selected) window/grid . The available options depend upon which window or grid is active. 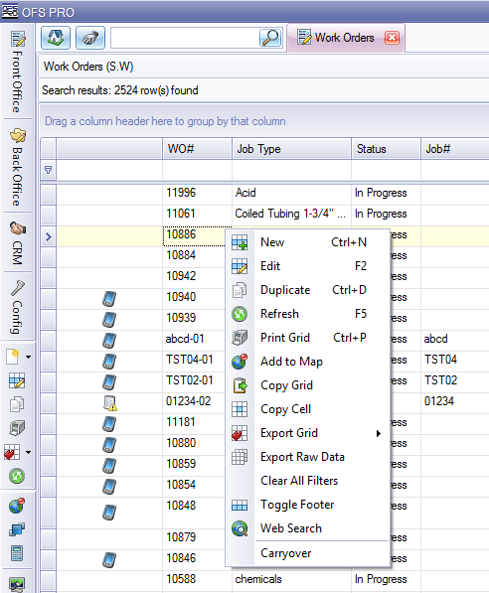 Duplicate – Creates a duplicate of the item selected in the grid. Print grid– Sends the active grid to the printer. Import – Imports data into the system in an Excel-friendly format based on established templates. A few windows are equipped with this functionality. Copy Grid – Copies the active grid to the clipboard (to paste into Excel). Copy Cell – Copies the active cell to the clipboard. Export Raw Data – Exports the raw data from the active grid to an Excel file. Clear All Filters – Removes all filters from the grid. Toggle Footer – Toggles the footer on and off. This enables or disables full viewing of the footer. 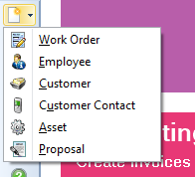 Carryover – Extend the end date of a work order. Only available on the Work Order and the calendar grids. Run Report – This menu item is visible only if the Reports area is active. When clicked, the selected report will run. (Other items in the Action menu are hidden while in the Reports area). Tree Mode – Opens the data in parent/child hierarchy form. Card Mode – Toggles Card Mode on and off. When Card Mode is on, assets are shown as small cards. When Card Mode is off, they are shown as a normal grid (only available on the assets listing grid). Refresh –Refreshes cached data from the database as well as the current screen. Reset Layout –Resets all window and grid layout customizations. Calculator – Opens in a window the calculator. For an easy-to-view graphical map of all items within all modules, see the Module Index topic.